"We exist to train God-hungry people in the disciplines of prayer." All of God's great prophets carried big sticks. Moses had one. He had it before his God-encounter in which God asked him to surrender the stick to God. He did and the rest is history. The rod became an extension of Moses' hand, and thus an extension of the hand of God. Exodus 4:2The LORD said unto him, What is that in your hand? And he said, A rod. Exodus 4:17 And thou shalt take this rod in thine hand, wherewith thou shalt do signs. Exodus 14:15 And the LORD said unto Moses, Wherefore criest thou unto me? speak unto the children of Israel, that they go forward: 16 But lift thou up thy rod, and stretch out thine hand over the sea, and divide it: and the children of Israel shall go on dry ground through the midst of the sea. God has given each of us a BIG STICK, a rod, to use over the power of the Wicked One. The rod is an extension of the hand of God. It represents His authority over all the power of the enemy. Having it alone does nothing. Using it as God commands is everything. It is the use of our spiritual authority in Christ that defeats the enemy. Jesus used his rod of authority when tempted by the devil. Each time he firmly planted his spiritual authority with the word, "NO!" We don't know that Jesus had a walking stick but we do know that he had all authority in heaven and in earth. Even with that authority he had to begin with setting the matter straight with a BIG "NO". Most of us as believers never really say no to the devil. We think "no" but we don't say it. Why is that? Do we think Satan is omniscient that he can hear our thoughts? There is no Scripture I know of that gives the devil the ability to read our minds. He cannot. He is a created being. He is not God or like God. He is not all knowing. He does not know what you are thinking. So we must speak to him. When the Scripture says "resist the devil and he will flee from you" (James 4:7) it means resist out loud, not under your breath or in your mind. Begin exercising your spiritual authority with a loud "NO!" The Apostle John uses both words for victory in the same verse. One is the verb of action for being victorious or carrying the day, or beating the enemy, that word is <3528> nikao. The other word is the noun for victory, nike. That got me thinking. I love taking time to go away to be alone with God. On many of those retreats I will spend considerable time walking in the woods worshiping the Lord with songs and prayers. Inevitably I am drawn to pick up a sturdy walking stick. I usually have a knife with me so I can smooth out the handle part of it. I have often done this with my grandsons too and I always being the stick home with me as a memorial of that special time with them in the woods. This past year I preached a sermon on the authority of the believer. It was really about believing God's promises and basking in them. 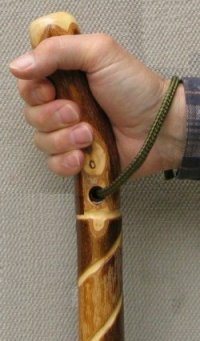 I brought one of my walking sticks to the platform and showed it to the congregation and described how the prophets had staffs, or walking sticks, as a symbol of authority in the Lord. Then I preached on five key truths from First John that my walking stick should remind me of. I challenged the congregation to go for a walk in the woods that beautiful Sunday afternoon, or at least sometime during the next week and look for a walking stick to remind you of your authority in Christ. Then I said they should bring it to church the next Sunday. To my surprise the next Sunday we had about 50 walking sticks show up at church. Some of them were quite creative. One young new believer pealed the bark off her stick, sanded it and carved each of the verses I preached on into it, varnished it, and then gave it to me as a gift that Sunday. Wow! What a gift that was. Since then she has followed up on the "walking stick" idea and made several, one from I John, one for my wife with the names of Jesus engraved on it and so on. So on my last prayer retreat alone with God I gathered many different waking sticks of different sizes and shapes. My favorite was an easy-to-peal bark, sort of a dark birch bark, that smelled just like Pepto-Bismo! As I prayed and searched the Scriptures for important truths I wanted to indelibly imprint on my mind and heart I came up with about 10 different categories of promises and truths to carve into my walking sticks. As I walk I pray, praise and claim God's promises to me. It is a faith-inspiring adventure that builds my intimacy with God and encourages my heart. Theodore Roosevelt was right - "Speak softly (to the enemy) and carry a big stick." Here are the eternal truths and promises from First John. Your Authority Rod: of promises, purposes, presence, praises, and protection. I have written to you, fathers, because you have known Him who is from the beginning. I have written to you, young men, because you are strong, and the word of God abides in you, and you have overcome the wicked one. You are of God, little children, and have overcome them: because greater is he that is in you, than he that is in the world. We know that whosoever is born of God sins not; but he that is begotten of God keeps himself, and that wicked one touches him not.